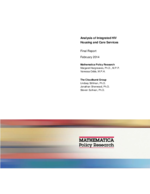 One of the original questions of the quantitative analysis was whether or not the available HOPWA and RWP data could support an analysis of the association between housing assistance, enhanced housing status, increased access and retention in HIV care, and improved clinical outcomes. Although RWP began collecting individual level data in 2010, before then, data were collected and reported at an aggregate level. All HOPWA data in this report are reported in aggregate. The lack of client-level data makes it difficult to examine any correlations between housing assistance and outcomes such as housing status, access to care or improved clinical outcomes. Although HOPWA does currently require grantees to report on participant outcomes, these outcomes are limited to housing status at exit from the program and are reported in aggregate across all participants. The lack of follow-up data for either program also makes it difficult to come to any conclusions about the intermediate and long-term impacts of HIV housing assistance.